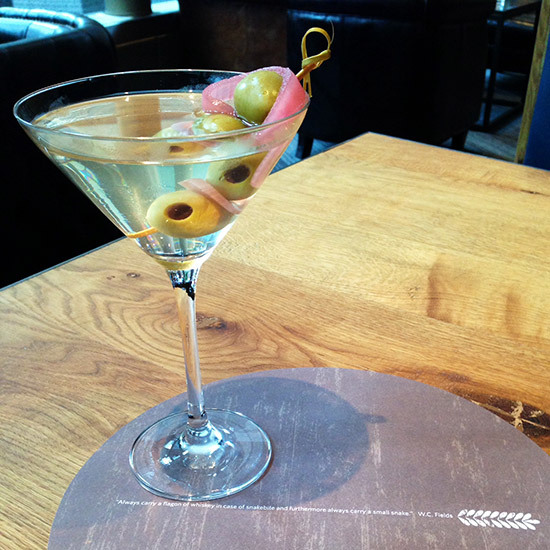 No one knows for sure who first spilled a splash of olive brine into a martini, sipped and said, “Yum.” But that person would be pleased to see that their legacy continues to this day, thanks to bartenders who are improving on the dirty martini. No one knows for sure who first spilled a splash of olive brine into a martini, sipped and said, “Yum.” But that person would be pleased to see that their salty, savory legacy continues to this day, thanks to innovative bartenders who are improving on the dirty martini. Here, four ways bars are reinventing everyone’s favorite brine-spiked cocktail. The Dirty Dirty Martini at Eventide Oyster Co., in Portland, Maine, makes use of something the bar has in spades—oysters. It’s made with vodka or gin, olive brine, a dash of Tabasco and strained oyster liquor reserved from the bar’s shucked mollusks. With drinks from Small Hand Foods owner Jennifer Colliau, a sound track from Brain Eno and two forthcoming robot employees, The Interval in San Francisco couldn’t simply serve a basic dirty martini. Instead, Colliau created one inspired by Naren Young’s version of the dirty martini at Saxon + Parole in New York, which uses olive-infused vermouth. Instead of simply letting olives sit in vermouth, Colliau purees vermouth with olives and a little salt, then filters it through a vacuum funnel. She mixes the briny vermouth with high-proof gin then garnishes it with drops of olive oil. At Charlie Palmer’s new Crimson & Rye in New York City, the Pickled & Dirty cocktail is for people who think dirty martinis aren’t dirty enough. Bartenders shake vodka with a splash of vermouth and an ounce of the bar’s pickled and dirty brine made with white olive brine, red olive brine and pickle brine from Brooklyn Pickles. The Dirty Truffled Martini at 51 Lincoln in Newton Highlands, Massachusetts, was created when beverage manager Emmet Kelty lifted some truffles and truffle oils from the restaurant’s kitchen. He used his loot to infuse some dry vermouth for a few days and, after tasting it, thought it needed some salt. That’s where the olive brine entered the picture. From there, the rest of the cocktail came naturally. He mixed the brine and aromatic vermouth with gin and celery bitters for an indulgent take on a dirty martini. The cocktail is garnished with a pickled green tomato from the restaurant’s roof garden.